You can call it any name you want---pao, mantou, bao---but the fact remains that it is one of the best things in the world. It is very difficult to find siopao in Switzerland, most Swiss have not heard of it and chinese restaurants don't offer it. Once in a while, one can find it in Asian stores. Unfortunately, those are only remotely similar to the ones that I knew growing up. Siopao is another example of chinese influence in Filipino cuisine. My father really likes siopao. I remember when I was young(er), we would eat wanton mami (wanton noodle soup) and siopao in a restaurant near the Quiapo Church. My father would mix the siopao sauce into the mami broth giving it a whole new dimension. I have very fond memories of those days. Until now when I close my eyes I can still taste the mami and siopao from that mami restaurant. 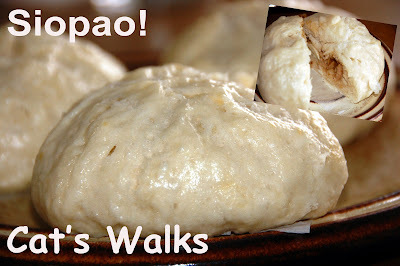 Living in a siopao-free country like Switzerland, it is essential to learn how to make them. When I embarked on this mission, I didn't know that it would be quite difficult. 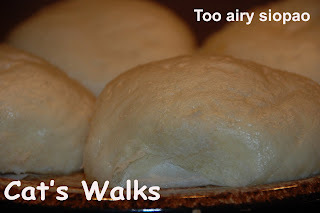 Learning to make the perfect siopao is a big adventure! I probably tried 10 different recipes before I hit on the right one. It is difficult to get the dough right. I even enlisted the help of a Chinese colleage. It is never soft enough, or white enough. Oftentimes, it was too airy or sometimes not enough fluffy. It was really very frustrating. My husband is too tired of my failed siopaos now to care much about it. At the end, I just tried the dough recipe without bothering to make the filling. If there is a nice meatball inside then I would be forced to eat it. Like this, I don't feel too guilty if I don't eat my current failure. Today, I think I hit on the right recipe. I found it on the internet in a forum. Of course, I changed it a little bit but the idea was there. Unfortunately, I cannot find the page again. To that woman who made this siopao possible, I thank you so much! I am really sorry that I cannot link you. It is a special day. I am very happy! To get to the recipe, please proceed to my food blog "Bubut's House"
Hahaha! I know the feeling. I ate siopao for the last time I think some 40 years ago, no kidding but remember wanting to taste it when we were in Sabah last year but was afraid they weren't clean in that part of Kota kinabalu where I saw them being sold. My taste buds have gone terribly European simply because I don't know how to do Asian cuisine and never really bothered. Enjoyed your blog posts as usual. But the thing is, she doesn't have the sauce for her siopao. I wonder if you know how to make the sauce. Will check out the recipe in your food blog. I will post the siopao sauce soon! =) Strange that I forgot to do it. I was also buying siopao from the Filipino shop in Oerlikon in Oerlikon but I never manage to catch it open because it closes early. Also, I really like to cook. The asian shop in Berninaplatz also sells siopao. I also buy there every now and then. 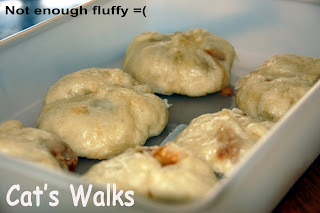 If the dough is giving you problems, there's a nice little cheat that you can use! Just use pre-made frozen dough. I don't know if they have that in Europe, but in the US, the have these loaves of bread dough that you can buy in the freezer section of our grocery store. Let it thaw then use it as you normally would. It seems like some vinegar in the steaming water helps keep the bun white!